Samsung has been manufacturing exceptional computer monitors for years now. It’s no wonder that people often turn to Samsung whenever they’re thinking about buying a new monitor. In the case of curved ultrawide monitors, Samsung has one strong contender that competitors should be wary about – the S34E790C. The Samsung S34E790C has a 34-inch curved screen with 3440×1440 native resolution and 21:9 aspect ratio. The panel used here is a Vertical Alignment (VA) panel, which is quite rare in the curved 34-inch niche. It supports 16.7 million colors with 300 cd/m2 maximum brightness. The screen has semi-gloss coating to prevent glare in various lighting conditions. The VA panel is sporting 4ms gray-to-gray response time and 60Hz refresh rate. Samsung claims an impressive 3000:1 static contrast ratio, while the dynamic contrast ratio is 80.000.000:1. Without the stand, the display is 16.3 lbs heavy. The stand bulks it up to 21.8 lbs. Various mounting options are supported using the VESA 100x100mm. This huge monitor draws 47 Watt of power when running. It’s a very good power draw considering the sheer size of the screen. As for connectivity, this monitor has 4x USB 3.0, 1x DisplayPort 1.4, 2x HDMI 1.4, 1x PC in, and 1x audio jack. There’s also a pair of 7-Watt speakers facing downward built in the back of the monitor. This monitor has a sleek two-tone design. The mix of black and silver makes it look professional. The top and side bezels are less than half an inch thick (11mm). The bottom bezel is a tad over half an inch (13mm). These slim bezels are slightly raised, so they are not flushed with the screen. Looking down from the top, you’ll notice the curvy nature of the display. The curved screen has 3000R curvature. It means that if you line the monitors edge to edge, it will form a circle with a 3000mm radius. It’s quite a subtle curvature. Most 34-inch monitors have something like 2800R or less. This slight curvature helps keep everything on the far left and right of the screen sharp due to the less acute angle. While the curve is subtle, it still adds to the thickness of the display when you view it from the side. The display alone measures 32.34 x 14.33 x 2.02-inches. That’s not bulky by any stretch, and it’s still look slim from any angle. The other reason why the monitor remains looking thin is that it’s using an external power adapter. An external power adapter has its own pros and cons. The good thing about it is that when it’s broken, you don’t have to tear the monitor apart to fix it and send it all for repair. Another advantage of it is that it keeps the heat off the monitor. The monitor itself produces noticeable heat when you use it for hours straight. When you add the heat from the power adapter, the back of the monitor needs to have bigger ventilation, which further increases the bulkiness. The rear part of the monitor is just black plastic featuring brushed metal texture. A moderate amount of ports is available there. From your point of view, they are all tidily arranged on the left-hand side. It’s nice that all the ports are facing backward. It makes plugging peripherals easier. When the ports are facing downward, you have to struggle to get them in and may accidentally alter the monitor’s tilt. Speaking of tilt, the stand can tilt 2 degrees downward and 20 degrees upward. It is also height-adjustable by 100mm which is roughly 4 inches. To keep cables tidy, the bottom of the stand has cable routing system. A simple yet handy feature to keep your desk looking more organized. There isn’t any button on the front of the monitor. There is one small joystick (jog button) on the back. That small control button, while usable, can be annoying to fiddle with. It doubles as a power button. The small size makes playing with the OSD awkward when you have fat fingers. The pair of 7-Watt stereo speakers on the back has decent power. You normally can’t expect much from built-in speakers, but these speakers will do just fine if you’re not too picky. By selecting Music on the Sound Mode setting, the sound quality is acceptable when you’re listening to music, watching videos, or playing games. Still, plugging in a pair of good headphones on the audio jack will give a much better audio experience. Commenting on the build quality, we have to say it’s superb. Even though it’s mostly plastic, both the monitor and the stand don’t appear cheap at all. The overall look is sleek and professional, and it will do well even in a high-profile office setup. Unlike most of the 34-inch monitors in the market, the Samsung S34E790C already has its stand attached. That’s one less work for you to do when the monitor arrives. That stand itself is one of the finest-looking stands you’ll see in the class. Samsung describes it as a curved T-shape, and it looks just like that. The sturdy stand connects to the back of the panel using a standard VESA attachment. If you feel the stand is too limiting or doesn’t go well with your desk, you can freely use any wall or desk-mounted monitor arm. Once you turn monitor on, you’ll see that the screen is way too bright and picture quality is all over the place. Samsung didn’t invest the time to calibrate the monitor at the factory. You will need to access the OSD using the small joystick at the back of the monitor to set the colors right. To give you a quick start, tone the brightness down to 38 and set the Gamma to Mode2 for a more vibrant look and improved depth. We also recommend setting the RGB to 50, 40, and 50 respectively. Since panel variation is a thing when it comes to LCD monitor, you may want to tinker with those numbers for a bit to find your most comfortable settings. Samsung gives you the flexibility of choosing between HDMI or DisplayPort. We recommend you go with DisplayPort if your graphic card supports it. That said, HDMI still offers excellent viewing experience albeit the 50Hz refresh rate limitation. The S324E790C uses VA panel that produces rich and vivid colors. Compared to IPS panels, VA has better uniformity and contrast. The claimed static contrast ratio of 3000:1 sounds impressive on paper, it also impressive in reality. This monitor is able to produce very deep blacks unmatched by IPS panels. IPS panels have something called IPS glow. This problem stems from the LED backlight used to illuminate the screen. The glow is more apparent on the corners of the screen when you have really dark background on your content. With VA panel, this problem is fairly non-existent. Yes, there’s such a thing called VA glow, and this monitor has it too. However, the minute yellowish glow is hardly noticeable in any situation. Still, VA panel has its own drawback – a rather limited viewing angle. IPS panel has a wide 178 degrees of viewing angle. Everything on the screen looks excellent whether you’re sitting right in front of it or at an extreme angle. Samsung claims that this monitor also has 178 degrees of viewing angle, both horizontally and vertically. In practice, when you view the screen from a normal viewing position, the colors on the edges will appear slightly warmer than the center. You won’t find this distracting in most situations, though. This is why the curvy panel helps so much. With the curve, everything on the edges is not at such an acute angle from your eyes. The color shift is only apparent when you want to look for it. When you’re working on a text-heavy document, the curve is perfect for you to read everything on the edges without sliding your chair to get closer to get a better read. Samsung employs Direct Current (DC) modulation to control the intensity of the LED backlight. The direct consequence of this is the virtually flicker-free backlight. The flicker-free display can prevent eye discomfort and fatigue. This is certainly an important point when you spend 8 to 9 hours a day staring at this monitor. If you’re coming from 4K monitors and wondering if the 3440×1440 is any good, we can assure it’s just as good. If you’re coming from a 27 or 29-inch 4K monitors, the S34E790C is even better. With 110ppi pixel density, the S34E790C is able to produce sharp images and text. The ultrawide aspect ratio fills your field of view, and the subtle curve adds to the immersion in games and movies. Just like any 34-inch ultrawide monitors, you’ll need DisplayPort to get the maximum refresh rate on 3440×1440. Using HDMI will only give 50Hz. Luckily, Samsung already includes the DisplayPort cable in the box, so you don’t have to buy one separately. Samsung S34E790C is a terrific gaming monitor despite the lack of G-Sync or Freesync that prevents screen tearing. The immersive gaming experience the curved display provides is something you have to experience yourself. The 60Hz refresh rate is certainly not the best in its class, but games still feel fluid. This monitor also has very low input lag. Any input from the keyboard or mouse is reflected on the screen instantly. For professionals and students looking for a monitor that can boost productivity, this monitor is a strong candidate for it. The extra screen real estate makes all the difference. No more clutter on your desktop. You can open two applications side by side, cross-reference your thesis, crunch numbers in a large spreadsheet, improve the workflow for photo and video editing, and a whole lot more. Now, some say texts look awful on this monitor. That is certainly not true. Texts are looking sharp on the Samsung S34E790C. Even the small texts are easy to read. If you’re running Windows 8.1 or 10, you can optimize the text quality further by adjusting the ClearType settings in the control panel. If the texts look too small for your eyes, a simple fix is to zoom the document to 125% or more – problem solved. Samsung includes a selection of presets which includes a Game Mode. Weirdly enough, Game Mode does nothing on input lag or pixel responsiveness. Makes you wonder why Samsung include that in the first place. Stick to the Standard mode for your gaming needs. VA panels already have excellent pixel responsiveness, so you don’t need extra steps to improve it. In Standard mode, games and movies will look great without smearing or unsightly trailing. High-contrast transitions remain pleasing to the eyes. One display mode that you may want to avoid is MagicBright. Supposedly, this mode will let you enjoy movies and games more by adjusting the backlight according to what kind of scene you have on screen. MagicBright is useless and cannot produce a good contrast when there is a mix of very bright and very dark part in a scene. Adjusting the brightness manually still gives you the best contrast overall. The Picture by Picture (PBP) feature is a welcomed feature on the S34E790C. Dell’s ultrawide monitors also have PBP, but the PBP in S34E790C has a big and important difference; you can set audio priority here. Every time you initiate PBP, the monitor already knows which window should it source audio from. You don’t need to fiddle with the joystick and dig deep into the menus to set it. In addition to PBP, this Samsung monitor also has Picture in Picture (PIP). You can play a game or work on something while having a small inset of your favorite TV show. It may not be something you’ll often use. Still, it’s there should you need it in the future. 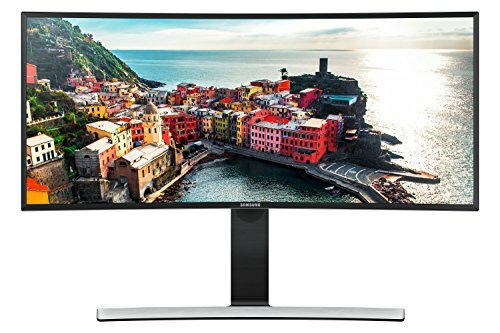 If you’re in the market for a big screen computer monitor, Samsung S34E790C is an excellent choice. Its ultrawide aspect ratio VA display coupled with 3440×1440 resolution makes it such an ideal choice for professionals. It also makes a great gaming monitor. Without any noticeable backlight bleed problem, you can enjoy your game in any kind of lighting situations. Initially, you can’t help but think that the curvy display is just a gimmick. But after a while, you’ll be wondering how did you ever get by using those flat screen monitors. A curved ultrawide monitor just feels so natural and Samsung is making a step in the right track with the S34E790C.